When Blair senior Paxton Sternberg walked out onto the mat in front of thousands of people Feb. 19 at the state wrestling tournament, he wasn’t be alone. In the moments before his opening match, when for a brief amount of time he collected his thoughts and traveled to a place of vision and deep focus, Sternberg wasn’t thinking about the crowd or the bright lights or the magnitude of the stage, the biggest in Nebraska high school wrestling. In that moment of reflection, Sternberg went back in time. Back to the intense training sessions this past summer in a muggy Blair High School gymnasium. He thought about the kid who was by his side through those grueling sessions, the pair drenched in sweat and bonding over a common goal. Sternberg thought about his practice partner. And then he wrestled. His headgear is brandished with the number 27. That’s not his favorite number, but it carries a deep level of significance to the heart and soul of the Blair wrestling team. It was the favorite number of Trent Hill, who passed away in an automobile accident on Oct. 11, 2014, a month and a half before his sophomore season. Hill, who wrestled at 106 during a freshman season that saw him come just short of a state tournament appearance, fell in love with wrestling in the third grade. His Blair teammates fell in love with his tenacity on the mat, and his personality off of it. Hill’s attitude was as infectious as that famous smile, according to teammates. He was driven, and that determination rubbed off on the rest of the Blair wrestling team. His mother, Karen, said her son dreamed of winning a state championship. A member of the Westside Wrestling Club, one of the 14 clubs involved with the Omaha Metro Area Wrestling Association (OMAWA), Trent competed year-round in camps and out of state tournaments. “As parents, we wanted him to have the experience and the knowledge so that one day he could have obtained his ultimate goal of winning a state championship,” Karen said, adding that Trent’s older brother and former Blair wrestler, Cody, wanted nothing more than to see his little brother compete in the state tournament. His father, Dion, and Cody were always there for support and advice when Hill needed it. His teammates believe Hill would have achieved that goal. “No doubt in my mind that he would have qualified this year at 113,” Sternberg said. Zach McDonald, the Bears’ sophomore 138-pounder, nodded along in agreement and echoed his teammate’s sentiment. That opportunity will never come for Hill. “Senior night, when his parents came and we honored him, that was pretty cool,” Sternberg said. Sternberg has earned quite a few wins this season, 33 of them to be exact. In early February, he captured his first conference title. A week later, on the court down the stairs from where he and Trent would train, Sternberg defeated a defending state champ from Skutt Catholic and won a district championship. With seven state qualifiers and a top-10 dual ranking, some would say the Bears have overachieved this season. Head coach Erich Warner said this year’s team shares a strong bond. “Every team finds a way to come together, but what the guys needed this year after Trent passed was each other. They leaned on one another to get through it,” Warner said. 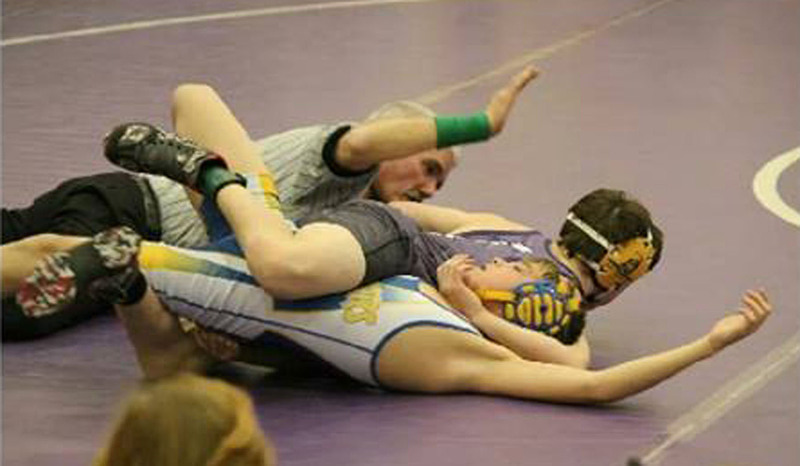 “Trent was a wrestler that every coach loves to have. He was an intense competitor, and he was loved by the rest of the team.” Warner said that the last time he saw Trent, he had just finished training, and had the sweat-drenched T-shirt to prove it. Classmate Samuel Braymen, also a member of the wrestling team, said losing his friend has taught him to cherish the time he gets with friends and family. Just two weeks after Trent’s death, Karen said the Hill’s received an email from a college interested in their son. His future was bright, and though he’s gone, each one of his teammates and friends have been impacted by the life of Trent Hill. “A lot of my skill comes from those practices with Trent and I owe a little bit of every win to him,” added Sternberg. Seven Blair Bears competed at this year’s state tournament. Each carried the memories of Trent Hill onto the mat with them. They wrestled with the intensity that Trent would have, because they believe was watching. They wrestled for their teammate. The easygoing jokester. The fiery competitor. The seven Blair Bears wrestled for the eighth. They will wrestle for Trent Hill.